Figure A shows the normal anatomy and location of the heart. Figure B shows a CardioWest TAH. Tubes exit the body and connect to a machine that powers and controls how the CardioWest TAH works. Credit: NIH. Figure A shows the normal anatomy and location of the heart. Figure B shows an AbioCor TAH and the internal devices that control how it works. Credit: NIH. 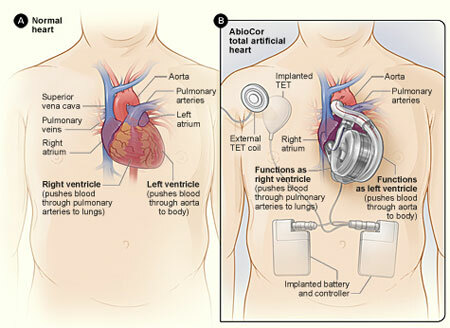 A total artificial heart (TAH) is a device that replaces the two lower chambers of the heart. These chambers are called ventricles. You may benefit from a TAH if both of your ventricles don't work due to end-stage heart failure. Heart failure is a condition in which the heart is damaged or weakened and can't pump enough blood to meet the body's needs. "End stage" means the condition has become so severe that all treatments, except heart transplant, have failed. The TAH is attached to your heart's upper chambers – the atria. Between the TAH and the atria are mechanical valves that work like the heart's own valves. Valves control the flow of blood in the heart. Currently, there are two types of TAH. They're known by their brand names: the CardioWest and the AbioCor. The main difference between these TAHs is that the CardioWest is connected to an outside power source and the AbioCor isn't. The CardioWest has tubes that, through holes in the abdomen, connect from inside the chest to an outside power source. The AbioCor TAH is completely contained inside the chest and is powered by a battery. The battery is charged through the skin with a special magnetic charger. Energy from the external charger reaches the internal battery through an energy transfer device called transcutaneous energy transmission, or TET. An implanted TET device is connected to the implanted battery. An external TET coil is connected to the external charger. Also, an implanted controller monitors and controls the pumping speed of the heart. A TAH usually extends life for months beyond what is expected with end-stage heart failure. If you're waiting for a heart transplant, a TAH can keep you alive while you wait for a donor heart. It also can improve your quality of life. However, a TAH is a very complex device. It's challenging for surgeons to implant, and it can cause complications. Currently, TAHs are used only in a small number of people. Researchers are working to make even better TAHs that will allow people to live longer and have fewer complications. Who needs an artificial heart? You may benefit from a total artificial heart (TAH) if both of your ventricles don't work due to end-stage heart failure. If you're waiting for a heart transplant, a TAH can help you survive longer. It also can improve your quality of life. If your life expectancy is less than 30 days and you're not eligible for a heart transplant, a TAH may extend your life beyond the expected 30 days. A TAH is a "last resort" device. This means only people who have tried every other type of treatment, except heart transplant, can get it. The TAH isn't used for people who may benefit from medicines or other procedures. TAHs also have a size limit. These devices are fairly large and can only fit into large chest areas. Currently, no TAHs are available that can fit into children's chests. However, researchers are trying to make smaller models. The United States Food and Drug Administration (FDA) has approved the TAH for certain types of patients. Your doctor will discuss with you whether you meet the conditions for getting a TAH. If you and your doctor decide that a TAH is a good option for you, you also will discuss which of the two types of TAH will work best for you. Before you get a total artificial heart (TAH), you will likely spend at least a week in the hospital to prepare for the surgery. You might already be in the hospital getting treatment for heart failure. During this time, you will learn about the TAH and how to live with it. You and your loved ones will spend time with your surgeons, cardiologist (heart specialist), and nurses to make sure you have all the information you need before surgery. You can ask to see what the device looks like and how it will be attached inside your body. Your doctors will make sure that your body is strong enough for the surgery. If your doctors think your body is too weak, you may need to get extra nutrition through a feeding tube before surgery. A chest CT scan. This test is used to make sure the TAH will fit in your chest. Current TAHs are fairly large. Before you have surgery, your doctor will make sure there's enough room in your chest for the device. Blood tests. These tests are used to check how well your liver and kidneys are working. Blood tests also are used to check the levels of blood cells and important chemicals in your blood. Chest X-ray. This test is used to create pictures of the inside of your chest to help your doctors prepare for surgery. EKG (electrocardiogram). This test is used to check how well your heart is working before the ventricles are replaced by the TAH. 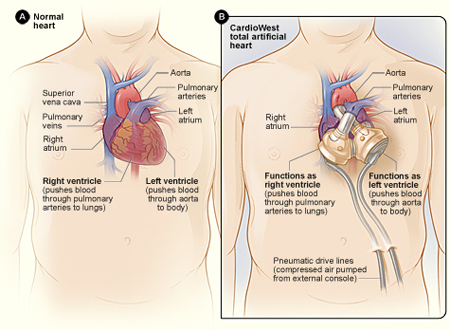 Total artificial heart (TAH) surgery is complex and can take between 5 and 9 hours. It requires many experts and assistants. As many as 15 people may be in the operating room during surgery. Before the surgery, you're given anesthesia to make you sleep. During the surgery, the anesthesiologist checks your heartbeat, blood pressure, oxygen levels, and breathing. A breathing tube is placed in your windpipe through your throat. This tube is connected to a ventilator (a machine that helps you breathe). A cut is made down the center of your chest. The chest bone is then cut and your ribcage is opened so that the surgeon can get to your heart. Medicines are used to stop your heart. This allows the surgeon to operate on your heart while it's not beating. A heart-lung machine keeps oxygen-rich blood moving through your body. The surgeons remove your heart's ventricles and attach the TAH to the upper chambers of your heart. When everything is attached properly, the heart-lung machine is switched off and the TAH starts pumping. Recovery time after total artificial heart (TAH) surgery depends a lot on your condition before the surgery. If you had severe heart failure for a while before getting the TAH, your body may be weak and your lungs may not work very well. Thus, you may still need a ventilator (a machine that helps you breathe) after surgery. You also may need to continue getting nutrition through a feeding tube. Your hospital stay could last a month or longer after TAH surgery. Right after surgery, you'll be in the hospital's intensive care unit. An intravenous (IV) line will be inserted into a vein in your arm to give you fluids and nutrition. You'll also have a tube in your bladder to drain urine. After a few days or more, depending on how quickly your body recovers, you'll move to a regular hospital room. Nurses who have experience with TAHs and similar devices will take care of you. The nurses will help you get out of bed, sit, and walk around. As you get stronger, you'll be able to go to the bathroom and have a regular diet. The feeding and urine tubes will be removed. You'll also be able to take a shower. You'll learn how to do this while taking care of your TAH device. Nurses and physical therapists will help you gain your strength through a slow increase in activity. You'll also learn how to care for your TAH device at home. Having family or friends visit you at the hospital can be very helpful. They can help you with various activities. They also can learn about caring for the TAH device so they can help when you go home. When you go home after TAH surgery, you'll likely be able to do more activities than you could before. You'll probably be able to get out of bed, get dressed, and move around the house. You may even be able to drive. Your health care team will advise you on the level of activity that's right for you. If you have an AbioCor TAH, you can shower or swim, as long as the device is charged. If you have a CardioWest TAH, you will have tubes connected to a power source outside of your body. The tubes go through an opening in your skin. This opening can let in bacteria and increase your risk for infections. You will need to take special steps before you bathe to make sure the tubes going through your abdomen don't get wet. Your health care team will explain how to do this. If you have an AbioCor TAH, you'll need to keep it charged with its magnetic charger. When it's charged, you can do activities that feel comfortable to you (as your doctor advises). If you have a CardioWest TAH, it will be attached to an external power source, or driver. The driver is portable, so you can walk around and do activities with it. While you recover from TAH surgery, it's very important to get good nutrition. Talk to your health care team about following a proper eating plan for recovery. Your health care team may recommend a supervised exercise program. Exercise is very important to give your body the strength it needs to recover. During the months or years when your heart wasn't working well (before surgery), the muscles in your body weakened. Building up the muscles again will allow you to do more activities and feel less tired. You'll have regular appointments with your health care team. The team will want to check your progress and make sure your TAH is working properly. If you have an AbioCor TAH, your health care team can check it remotely. This means that if you think something is wrong, you can hook up the device to a computer with Internet access. The computer will transfer data to your health care team so they can see how your TAH is working. Certain problems may require you to see your doctor to have them fixed. The CardioWest TAH can't be checked remotely. With both types of TAH, your health care team will explain warning signs. If these signs occur, or if you start feeling sick, you'll need to see your doctor right away. Your health care team may recommend cardiac rehabilitation (rehab). This is a medically supervised program that helps improve the health and well-being of people who have heart problems. Rehab programs include exercise training, education on heart healthy living, and counseling to reduce stress and help you return to a more active life. You will need to take medicine to prevent dangerous blood clots for as long as you have a TAH. Regular blood tests will show whether the medicine is working. You also will need to take medicine to try to prevent infections. Your doctor may ask you to take your temperature every day to make sure you don't have a fever. Fever can be a warning sign of infection. Make sure to take all your medicines as prescribed and report any side effects to your doctor. If you're on the waiting list for a heart transplant, you'll likely be in close contact with the transplant center. This is because most donor hearts must be transplanted within 4 hours after removal from the donor. Some heart transplant centers give you a pager so the center can contact you at any time. You need to be prepared to arrive at the hospital within 2 hours of being notified about a donor heart. Getting a TAH may cause fear, anxiety, and stress. If you're waiting for a heart transplant, you may worry that the TAH won't keep you alive long enough to get a new heart. You may feel overwhelmed or depressed. All of these feelings are normal for someone going through major heart surgery. It's important to talk about how you feel with your health care team. Talking to a professional counselor also can help. If you're feeling very depressed, your health care team or counselor may prescribe medicines to make you feel better. What are the risks of total artificial heart surgery? Getting a total artificial heart (TAH) involves some serious risks. These risks include blood clots, bleeding, infection, and device malfunctions. Because of these risks, only a small number of people currently have TAHs. There's a small risk of dying during TAH surgery. There's also a small risk that your body may respond badly to the medicine used to put you to sleep during the surgery. However, most patients survive and recover from TAH surgery. If you're eligible for a TAH, you will work with your doctor to decide whether the benefits of the device outweigh the risks. Researchers are working to improve TAHs and lessen the risks of using these devices. When your blood comes in contact with something that isn't a natural part of your body, such as a TAH, it tends to clot more than normal. Blood clots can disrupt blood flow and may block blood vessels leading to important organs in the body. Blood clots can lead to severe complications or even death. For this reason, you need to take medicine to prevent dangerous clotting (anticlotting medicine) for as long as you have a TAH. The surgery to implant a TAH is very complex. There are many places in your chest where you could develop bleeding during and after the surgery. The amount of anticlotting medicine you take also raises your risk for bleeding. Balancing the anticlotting medicine with the risk of bleeding can be hard. Make sure to take your medicine exactly as your doctor prescribes. One of the two available TAHs, the CardioWest, attaches to a power source outside your body through holes in your abdomen. Any time you have a hole in your skin, it increases the risk of bacteria getting in and causing an infection. With permanent tubes connected to the outside through your skin, this risk for infection is serious. You will need to take medicines to try to prevent infections. Your health care team will need to watch you very closely if you have any signs of infection, such as fever. You may need to check your temperature several times a day as part of your ongoing care. With both types of TAH, there's a risk for infection after surgery. Your doctor will prescribe medicine to reduce the risk. This doesn't mean a TAH is bound to fail. In fact, those that have been implanted in people in recent years have generally worked very well. However, problems with how well a TAH works can occur.